If you are welcoming a new kitty into your home… celebrating the forever cat in your life… saying good-bye to a beloved cat companion…For Every Cat An Angel is the perfect way to remember that timeless connection to your special four-legged friend. Filled with colorful illustrations on every page, this gentle and uplifting book will bring comfort and hope to anyone who is coping with the loss of a cat who was dearly loved and is deeply missed. May their paw prints dance forever in your heart! For cat lovers young and old. * Every book is autographed by the author! 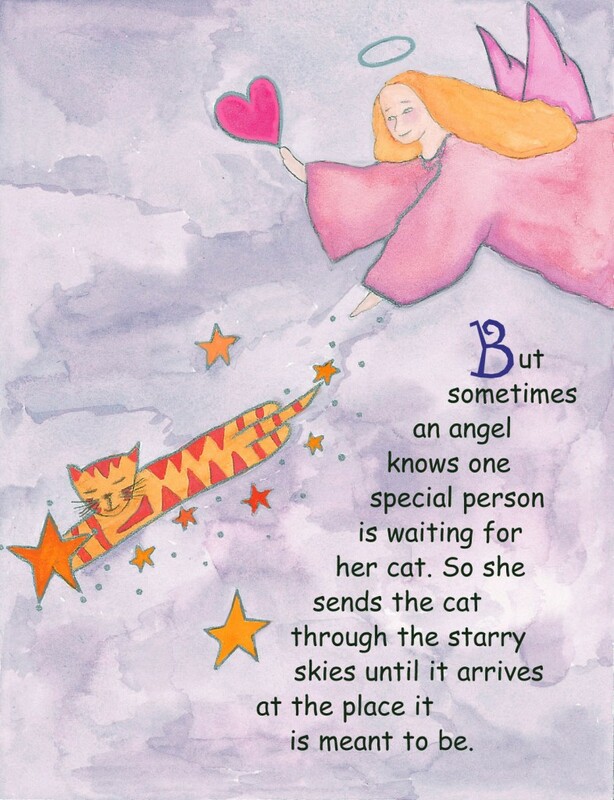 But sometimes an angel knows one special person is waiting for her cat. So she sends the cat through the starry skies until it arrives at the place it is meant to be. 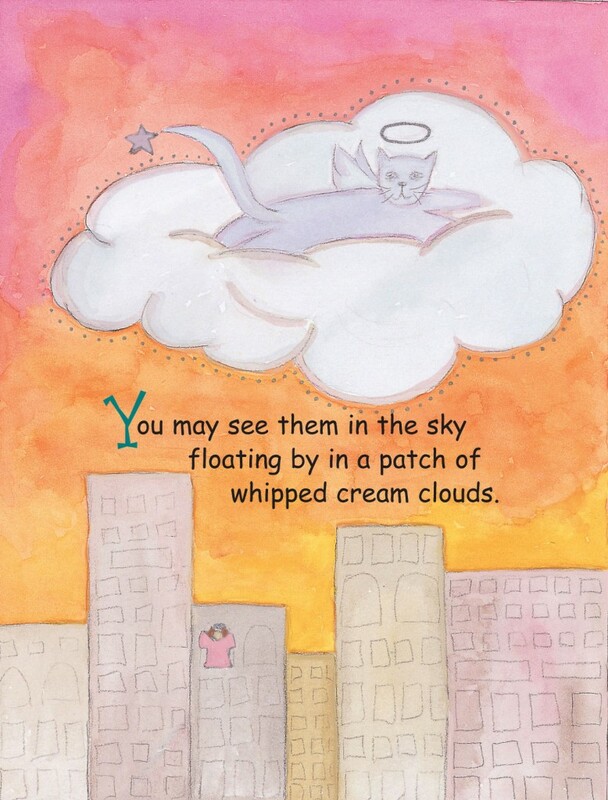 You may see them in the sky floating by in a patch of whipped cream clouds. From the moment Jake came into her life, he made his feelings about cats perfectly clear – they were best served on a plate, with a side order of fries! 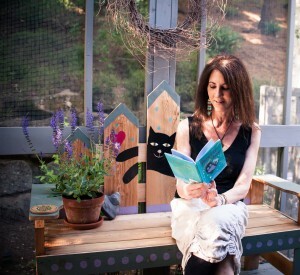 This was very disheartening to author Christine Davis, because she wanted to adopt a kitty and bring some magical feline energy into her home. Jake, however, wasn’t going to make this easy. In May of 1998, the author looked out her window and saw Jake with his ears up and his head cocked sideways, staring at the ground. Sitting by his feet was a tiny kitten. It had badly infected eyes, and probably couldn’t see the big dog drooling over it. Chris ran outside, hoping to prevent the cat attack she felt sure was coming. But Jake just stared at the helpless creature, then looked up at her and then turned back to the kitten. Perhaps it was because he remembered a time when he, too, had needed a home – we will never know. 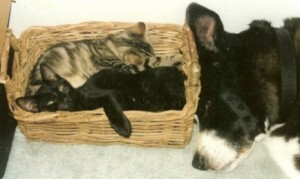 But in that one moment, Jake opened his heart to the tabby kitten, and little Pippen become part of the family. More meowing told them that Pippen was not an only child. Indeed, she had a brother who was hiding under the deck. 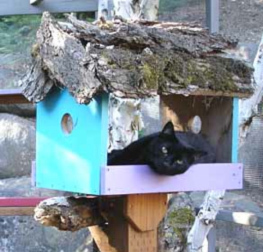 With a little bit of food as encouragement, the black kitten with the bent tail crawled out, and that is how Dickens found his place in the household. Later that night, the mama cat left three more kittens on the front porch. 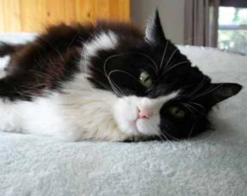 Molly, a black and white tuxedo cat, and Star and Gracie, her sleek, black sisters, were brought in from the cold, and Jake’s kittens were finally safe and the family was complete. Jake brooded over his feline family, licking the formula off their faces and nosing them back if they wandered too far. He allowed the kittens to swarm over him, snuggling into his thick, warm fur. Although Gracie was destined to make her home with some good friends, Dickens, Pippen, Molly and Star immediately settled in and took over the house. Jake’s days became very busy, what with four active charges to take care of. But it was the author whose life was changed forever. She hadn’t realized there had been four empty places in her heart that only these little furballs could fill. 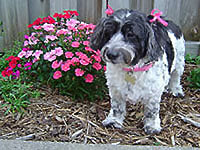 She hadn’t realized she had needed a feline fairy Godmother, a role that Pippen was meant to fill. She hadn’t realized life could be so much more fun if you looked at the world through the eyes of a kitten. 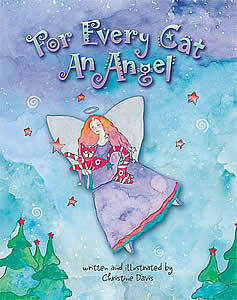 For Every Cat An Angel was written to welcome Dickens, Pippen, Molly and Star into the Davis household. Although Dickens, Pippen and Star are now flying through the heavens with all my angel dogs, I still feel their magical presence in my heart and home. May they watch over me until we can all be together again. ~ Geoffrey D. Nusbaum, Ph.D.